HTTPS Everywhere is exposing many organisations with unmanaged Domains and SSL certificate estates to data breach risk, which could result in GDPR fines and director prosecutions. Trustify has now surveyed over 3,000 Enterprise Organisations and found that the Technology Leadership in over 62 of these organisations is either ignoring the issue of HTTPS everywhere as a cosmetic issue or deprioritising it as a low level risk. Worse still, some brands are installing FREE SSL certificates believing that this false economy fix is fit for purpose. British Airways recently understood the full impact of why FREE SSL certificates represent serious risk when they exposed 380,000 customer to Cyber Criminals who had acquired a FREE SSL certificate to legitimse their payment card fraud – that’s why Banks don’t use FREE SSLs. Good Business Authentication and Data Encryption create Digital Trust. That’s why Trustify has introduced the LEI EV SSL certificate – using the Legal Entity Identifier for the first time. This new standard in B2B2C online identity presents the organisation name clearly in the address bar so that the user can be left in no uncertain terms who they are dealing with. This new LEI EV SSL is deployed from our Certificate Services platform, which incorporates Domain Risk Management and ground-breaking Certificate Automation across multiple Certificate Authorities as well as unlimited issuance for large organisations. Discovery – best in class endpoint scanning for exposure to HTTP and TLS issues across every CA. Issuance – Instant issuance of LEI EV SSL certificates and many other classes including Code Signing, Document Signing & S/MIME certificates. Installation – point and click auto-install across every stack = no more fiddling. Management – Renewal, Reissuance, Replacement, Revocation in a Multi-CA world all in one place – DIY or a Managed Service with Zero expiry risk. Reporting – real-time reporting of bad keys and certificates, vulnerability scanning and compliance mapping to your mobile device. Commercials – Pay per certificate or pay a fixed price for Unlimited issuance? – you choose. Developing a connected digital brand strategy ensures your digital portfolio is working hard. We optimise your assets to seize control of growth opportunities, regain lost web traffic, and maximise the return on investment of your digital portfolio. Rogue, unknown and unmanaged certificates are an easy target for hackers. You need complete visibility into your infrastructure to control access to these certificates. CLOUD SSL enables on-demand discovery of certificates from servers, clients, and ADC devices and refreshes your inventory regularly with a midnight sync option. Weak certificates and unregulated access can compromise the security of your application infrastructure. With CLOUD SSL, administer policies, such as recommended cryptographic techniques, CAs, and workflows, to eliminate rogue certificates. Delegate access and apply granular visibility to individual certificates or certificate groups to enable efficient provisioning. Each step in the certificate enrolment process introduces the possibility for costly human errors. With CLOUD SSL’s automation features, you can use a single console to order certificates from any supported CA or from your own internal CA, push issued certificates to multiple devices, renew existing certificates, revoke certificates and delete unused certificates all with ease and accuracy. Compliance builds trust. Trust builds a larger customer base. With CLOUD SSL, enforce policies and ensure encryption compliance with Federal Information Processing Standards (FIPS-140). The safety of your private keys is ensured using our AES-256 encrypted database or even better, a FIPS 140-2 certified HSM. Sifting through the thousands of certificates in your inventory can be cumbersome. With our holistic view, CLOUD SSL graphically represents important certificate information like the certificate’s chain of trust and its associated devices. 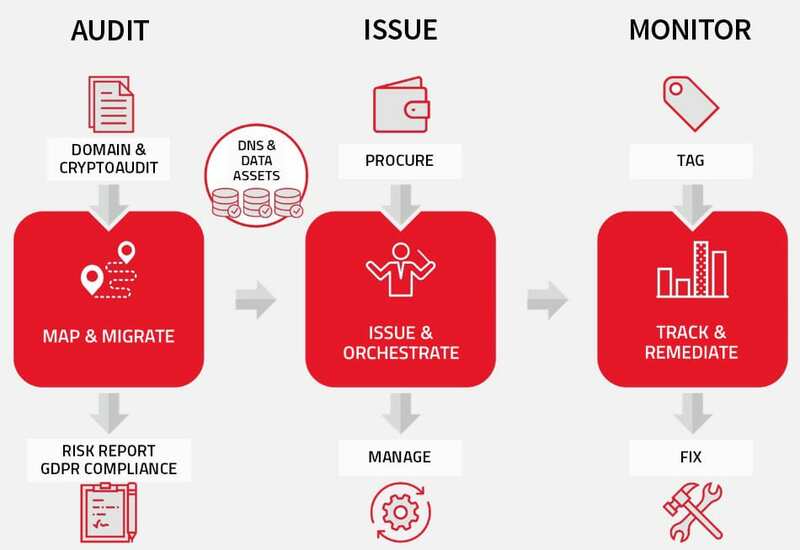 You can also perform necessary life cycle management processes like issuing, renewing and revoking multiple certificates without having to leave the holistic view. Unplanned system outages are both fiscally costly and damaging to a brand’s reputation. CLOUD SSL provides scheduled reports on non-compliant certificates, expired but unrevoked certificates, and soon to expire certificates to proactively address vulnerabilities. You can choose to receive these alerts/reports through emails or SNMP traps.